This means that baseballs are flying out of ballparks at much lower rates today than they were at the beginning of the new millennium. Home runs peaked in the 2000 season, with almost 5,700 balls leaving the park (1.17 per game). Those numbers have been in a fairly steady decline since, reaching a nadir of 4,552 (0.94) in 2011, and still only at 4,934 (1.02) last season. So what’s a fan who just wants to see a few dingers to do? Well, don’t forget about the weather. Baseballs tend to travel farther when the air is less dense, and of course a good tailwind helps as well. And there’s an app that can help fans track conditions at their local Major League stadium and, most importantly, let them know the likelihood of home runs at that day’s (or the next day’s) game. Home Run Weather takes into account temperature, atmospheric pressure, humidity, wind direction and speed, the orientation of the ballpark, and the drag coefficient of a baseball to calculate the home run index, which tells how favorable conditions are for home runs at every game in every Major League park. The index, which is available for both current conditions and hourly over a 24-hour period, is given on a scale of 0 (least favorable) to 10 (most favorable). The creation of the index incorporated both analysis of weather and home run data over several seasons at Citizens Bank Park in Philadelphia as well as a theoretical, physics-based model that calculates how far a baseball will travel in specific atmospheric conditions. 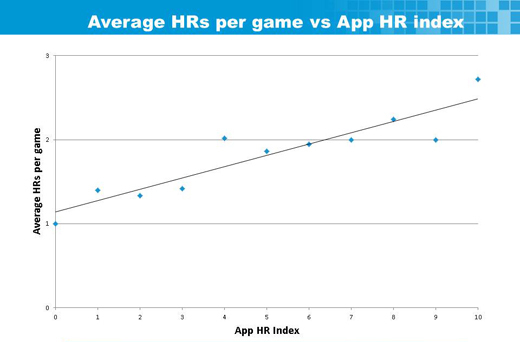 The accuracy of Home Run Weather is indicated in the chart below, which shows the average number of home runs hit per game over the course of the 2012 season for each of the app’s index values. The app is available for both iPhones and Androids. And just a quick heads up: tonight’s Nationals-White Sox game at 7:00 in Washington, D.C., gets a “10” on the home run index (forecast of 80-degree temps, 12-mph winds, 49% humidity, and pressure of 29.85″), so if you like home runs, get yourself to Nationals Park! Chart courtesy of The SI Weather.